Vinyl fences are truly maintenance free. 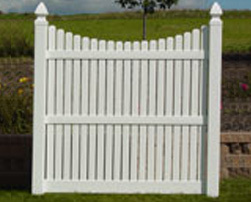 ​Scroll down to see our selection of vinyl fence for installation on your property. Hook us up with your contact information and we'll get things rolling for you! This fence offers a cost effective way to have a safe, maintenance free, Lifetime enclosure. ​This style gives a privacy impression that still allows sunlight & air to filter through the routed slats. ​This fence offers moderate privacy with alternating pickets for a unique style. This fence, like the Utah, offers moderate privacy w/smaller alternating pickets for a unique style. This style is a great pool fence application & meets most zoning regulations and BOCA codes. Reccommended for FLAT GROUND Installation only. Beautiful semi private fence with a scalloped top accents any back yard and provides the privacy you are seeking with air flow through the pickets. ​This style is also a great pool fence application & meets most zoning regulations and BOCA codes.